The red pen wielding Rebeccah Giltrow came by for a visit today. She’s a prolific author with an astonishing number of interests and activities. She claims to be something of a procrastinator, but with all she does, I can’t imagine her being much of a dawdler. Now, let’s find out who Rebeccah really is; shall we? 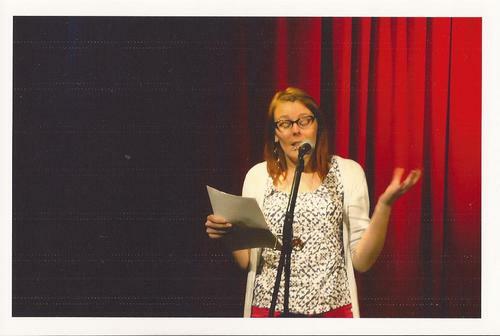 Rebeccah has been a writer since she can remember, but after graduation from University of Essex in 2005 with B.A. (hons) English Language & Literature, and again in 2008 with M.A. Literature: Creative Writing, she decided to take the craft more seriously and became an avid follower of the Oulipo, focussing on this for her final dissertation. Since graduating from university, Rebeccah has written a collection of 26 lipogrammatic short stories, Betwixt The Cup and The Lip, a collection of 12 Christmas stories, Twelve Days of Krista May Rose, and a full length novel, Lexa Wright’s Dating Sights. Excerpts of these can be found on her blog. She is currently writing her second novel, Here We Find Ray, as part of the NaNoWriMo (National Novel Writing Month) challenge. When she’s not writing, Rebeccah enjoys producing visual art, and occasionally takes photos, paints pictures, and makes collages. Her work has been shown at The Halesworth Gallery, The Ferini Gallery, and Lowestoft Arts Centre. Here are five little pieces information about me that you perhaps may, or may not, find interesting. I have a moustache tattooed on my right forefinger. If I could have any skill, it would be the ability to breakdance. I don’t like drinking hot drinks because I always end up burning my tongue. I’m at my happiest when I’m listening to music and watching films and television programmes from the 80s and early 90s. Nothing beats regressing back to childhood! Reading, but that’s a given. It’s impossible to be a good writer if you’re not a good reader. I have a number of books dotted around the house, with bookmarks poking out of the pages at various stages, begging me to finish reading them! I also paint, make collages, take photos, melt wax crayons, and do other arty type things. I go to the gym, swim, and I’ve recently taken up Pilates. I need to do those things because I also enjoy baking. And if I’ve got any time left over after that, I spend time down at the beach with my dog. At the moment I don’t work. It means that I have the time to write, uninterrupted. I started writing when I was a child, then I gave it up when I was a teenager. I became disinterested with life, and found everything ‘boring’. Thankfully my passion was rekindled when I went to university, and after taking a creative writing module and receiving positive feedback from my peers, I realised it was something I enjoyed again, and it was something I was good at. Since then, I’ve written pretty much every day. I started writing my first novel (technically it wasn’t my first novel; it was just the first one that I finished) on 6th March 2012, and 37 days later I had a 120,000 word manuscript. It was far from perfect, and took a couple of months to proof read, edit, and rewrite. But I didn’t care. I’d written a book. Most of the time, I don’t know. I might see something on the television, or read something, or see someone, and an idea will spark off in my head, and that might develop into a story, or it might go nowhere. Of course. Find me a writer who doesn’t! But the best way to deal with it is to write about it. I always have some sort of idea for a story, but I think part of the fun of writing is watching the story develop. I can go to bed thinking that the story will go in one direction, but when I start writing the next day it goes off in the opposite direction. I’ve never been a planner. It turns something creative into something a bit too clinical for my liking. I can’t say that there’s one stand out book or author. Various things have made an impression on me throughout my life. I’d say that my favourite authors are Roald Dahl and Margaret Atwood. I don’t particularly write in their style or about the same subjects, but I really enjoy their work and would love to be as successful as them! There are always going to be challenges when it comes to getting published. First come the rejections. They’re horrible. You put blood, sweat, and tears into writing your manuscript and making it presentable for the agents to read, only to be told that they don’t want it. It’s like having someone tell you that your baby is ugly! But if you want something badly enough, you’re going to find a way to overcome the challenges. I would do more research into self-publishing and the many facets of that area, such as formatting a manuscript and producing a front cover. I think I blindly wandered around and stumbled in the right direction. I would have liked to have been a bit more prepared! At the moment I’m not too sure how to go about with the marketing aspect. As I’ve self-published, I don’t have the luxury of a publicist. I guess the first step is to utilise social networking so that as many people as possible can find out about you and what you’ve done. And hopefully it’s possible to build a following that way. I think my favourite part was the ending. Or in this case, two endings. Lexa Wright’s Dating Sights is a romcom, and books or films of that genre always have a happy ending. So I wanted to write a happy, ride off into the sunset on the back of a white horse with the man of her dreams ending, and a more realistic ending where she ends up in the same situation that she started off in; single and miserable. I won’t tell you which ending I went with, but I enjoyed writing the two, and thinking about where each one would lead if I wrote a sequel. I really should give my characters more credit than I do. They write the story for me, and I just put my name on the front cover! Lexa, the main character in Lexa Wright’s Daring Sights, is a procrastinator. So in order to give an accurate portrayal of her procrastination activities, I was required to do extensive research and do a good few hours of procrastination each day. A few years ago I started writing a story about a woman who joined an internet dating site, but I never finished it. I wanted to write a modern-day love story but wasn’t sure what direction to take it in. The idea floated around in my head for a while but never went any further, until I had the urge to write a book. I just changed the perspective and the voice, and found that the words flowed. Ha! I’d love to say that I’m super professional, and that my desk is tidy, and all my research and notes are filed away. But honestly, it’s nothing like that. I work on a desktop computer in a room where I can shut the door so that I’m not disturbed. My desk starts off reasonably tidy, but as the days go on, it becomes covered in Post-It notes, which I stick around the monitor, on to my speakers, on to my lamp; well anywhere there’s a space to stick them. The Post-Its usually contain ideas for future parts of the plot, or family trees, or characters’ dates of birth. I also have to have music on. I don’t have a favourite genre or artiste to write to. I just find silence too distracting. My dog, Lily, likes to join me when I write. She doesn’t do much, apart from curl herself up in some part of the room and snore loudly. That’s a bit of a lie actually. One day I sat down at my computer, and looked up at the clock on the wall to see that the time hadn’t changed for hours. Lily then plodded in to keep me company. I wanted to write but I wasn’t sure what I wanted to write about, so I wrote about a woman sitting at her desk who wants to write. She looks up at the clock on the wall, and the hands are stuck at nearly ten past eleven because the battery has died. Her dog, Beryl, plods into the room to keep her company. This became the opening scene of my novel, Lexa Wright’s Dating Sights. So if my dog hadn’t plodded in, I may not have had the inspiration to write anything! At the moment, I don’t really have a process, but that’s because I’m not properly working on anything serious. I’m just doing odd bits of writing here and there. But when I have a project, such as a novel, I like to set myself word count targets, of usually 1,000 words. When I’m in ‘the zone’ I’ll obviously write a lot more, but I think 1,000 is a nice number to aim for. Even if those 1,000 words are rubbish, I can always work on them to improve them. Somebody told me that you can’t edit a blank page, so no matter what you’ve written it will help in some way to propel your story. I’m slowly working on my NaNoWriMo (National Novel Writing Month) novel. I managed to write just over 50,000 words in the month, but then left it without finishing the story. It’s called Here We Find Ray and it’s about a young boy who falls in love with an older woman, but as he gets older his innocent infatuation turns into an unhealthy obsession. I’ve got an idea how I want it to end, but as with most of my writing, it can take on a life of its own. So I’m looking forward to finishing it. 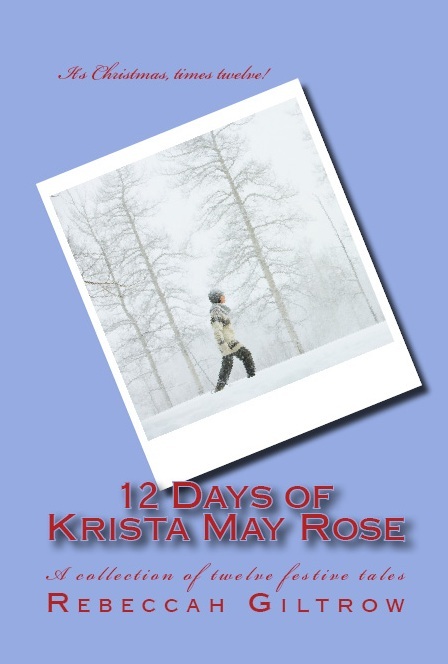 The best compliment I’ve received was in response to my collection of short stories, 12 Days of Krista May Rose. I had initially published it as an e-book (although now it is available as a paperback – sorry for the shameless self-promotion!) and a few friends downloaded it. They all really enjoyed but, but they all said that they had wished it was longer. It’s great to know that you’ve written something that people have enjoyed, but also that they wanted more. I haven’t yet received any criticism yet (apart from the constructive kind), so I’m not sure how to deal with it. But no doubt I’ll find out at some point. Firstly, thank you for reading. Without the reader, the writer would be redundant. Secondly, I’d love to hear from my readers, either through a comment on a blog post, or a book review on Amazon, or a retweet on Twitter. It’s nice to know who my readership is on a personal level. Thanks so much for coming by today, Rebeccah. It’s good to know more about you! This entry was posted in Author Interviews and tagged !, author, Interview, literature, reviews, writing. Bookmark the permalink. Thank you for the interview, Jim. It looks great! Ha! Well it’s a prerequisite; if you want to be a writer, you have to be a procrastinator first! !